Archival Records @ Asia Art Archive, a sound installation by Cédric Maridet, Hong Kong :: exhibition from February 2, 2010 to May 5, 2010 :: Opening: February 11, 2010; 6.30 – 8:00 p.m :: Hollywood Centre 11th Floor, 233 Hollywood Road, Hong Kong. Archival Records intends to articulate the Archive’s physical and material space through the medium of sound, and establish a new connection between the Archive’s ‘voices’. It focuses on the realm bridging textual readings (of printed material) and their vocal counterparts, through multilingual audio recordings of excerpts from the collection, supplemented by ambient sounds at the Archive. This sound installation not only aims at exploring the idea of the Archive, but also rediscovering the mechanics of sensory experiences and aural cognition through a composed technological mediation of experience. 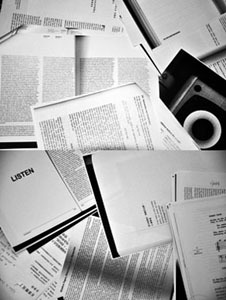 Archival Records focuses on the reading of selected texts found in the Archive, which deal with sound or its particular vocabulary, either directly or indirectly. The collection of recordings will be continued during the exhibition with texts read by: Anthony Yung / Mary Lee / Asako Nishikado / Enoch Cheng / Kathy Mak / Angela Su / Janet Chan / Erika Kobayashi / Nadim Abbas / John Batten / Judith Pernin / Juliette Chen / Cedric Maridet / David Boyce / Rachel Catanach / Nana Seo / Angela Su / Xue Tan. Cédric Maridet is an artist based in Hong Kong since 1999. He received his PhD in media art at the School of Creative Media, City University of Hong Kong in 2009. His research aims at clarifying fundamentals in the heterogeneity of listening intentions in order to frame essential connections for sound art in a holistic, perceptual and theoretical approach.